I watched this last night with my girlfriend (who had the superb taste to love it, or else I’d have to rethink this whole relationship) in honor of the 70th anniversary of the film’s premiere. I struggled with how I was going to write this review, and considered skipping it entirely. After all, what can I possibly say that hasn’t been said already? But then I thought, why reinvent the wheel? If it’s been said already, then just quote it. What could be more appropriate for a movie that’s so quotable itself? This entry was posted on April 25, 2014 at 10:58 am	and is filed under Movie Reviews. You can follow any responses to this entry through the RSS 2.0 feed. You can leave a response, or trackback from your own site. A piece of trivia: There is a story that Billy Wilder being a pal of Marlene Dietrich, named the Stanwyck Character Phyllis Dietrichson and modeled her hairstyle on the one Dietrich had in the 1941 Raoul Walsh movie “Manpower” -it is pretty identical. 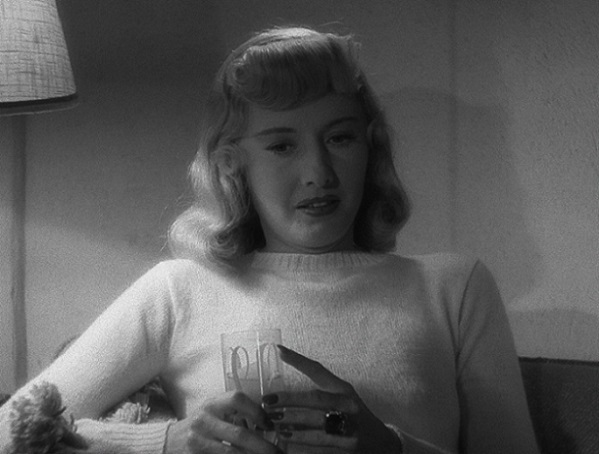 I saw a piece of The Lana Turner performance in the cult “the Postman Always Rings Twice” the other day and could not help but think how Stanwyck was a far superior film noir actress. It’s a Great movie. Well, Babs is tops. No one beats Stanwyck. But I agree, Turner is particularly disappointing in Postman. Babs truly is tops, every time out she impresses. She’s my favorite actress of all time (and I know you once said the same, give or take the great Madhabi Mukherjee). I really love this movie and was lucky enough to see it on the big screen at the Film Forum in NYC with my girlfriend and her brother. I was afraid they wouldn’t like it, but of course like your girlfriend, they had the superb taste to love it. It really is one of those classic Hollywood movies like “Casablanca” that seems impossible to improve upon. Great movies are still made every year, but that era was truly special. I watch both of those movies about every other year and they always live up to the hype. I really enjoyed this review Martin. I think incorporating so many different voices along with your own really hit home how great this movie is. I’m looking forward to your new top 100 and will have to give “Once” another look. I liked it the first time for sure, but your review made me think I may appreciate it even more on a second viewing. Thanks so much, Evan! Lucky you to see it on the big screen, and with appreciative company. My updated top 100 will be coming in July, maybe early August. Probably not too many surprises for anyone who reads this blog, but I am hoping to shake it up a bit. Wow, that quote from me sounds brilliant! Of course, I don’t remember writing it. Interesting approach to a review, with lots of great material. Your quote at the end is one of the best. Thanks Dan! I can barely remember most of the movies I’ve seen, much less the reviews I wrote!